I swear, I had never really eaten sauerkraut in any form when I was growing up. Why Mom never had a go at making it herself is a bit of a mystery, since the basic ingredients are cheap and plentiful, the process pretty simple and the results quite tasty. Likely this was because our own ethnic background is English and Scots-Irish, and it's just not one of those things. Cabbage being a sturdy green vegetable and well-adapted to the frozen northern hemispheres, it's a mainstay in peasant cooking from Germany, through Eastern Europe and Russia – and even into Korea, where they make a high-octane variety spiced with garlic and hot red peppers known as kimchi. 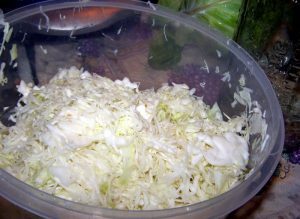 But the ordinary sauerkraut is the simplest to make at home; basically, it's thinly-sliced fresh cabbage and Ball pickling salt. At some point a couple of years ago, we were buying a brand of pickles or marinated artichoke hearts at Sam's Club which came packaged in massive glass jars, which hold 6-quarts to two gallons. I saved out two of them to store bulk foods in, although they had to go through the dishwasher several times to entirely remove the smell of pickle brine. They're perfect for fermenting the shredded cabbage in the first step. 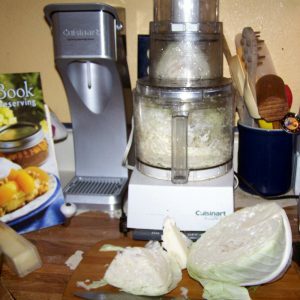 Trim of the outer leaves of four heads of cabbage, quarter the heads and cut out the solid core, then either thinly sliver the quarters, or cut into eights and run through a food processor fitted out with a slicing blade, or a mandolin – or even an old-fashioned sauerkraut slicer. It was customary back when to make massive quantities of kraut at a time – a friend of mine in Fredericksburg recently an old-fashioned 5-gallon crock which would ferment enough to feed a small army. I have a huge metal mixing bowl made for restaurant use, so the shreds of cabbage from four heads fill it rather nicely, but you may have to process it one or two heads at a time. Mix the shreds of cabbage with ¾ cup of pickling salt, kneading it gently, as the salt dissolves and the cabbage begins to give up liquid. Let sit for a few minutes and then pack it tightly into the jars until just to within an inch of the top. One of the cabbages I used this week was rather large – so the cabbage shreds filled both big jars and then a quart canning jar. One of the big jars also had two teaspoons of caraway seed added, for extra flavor. 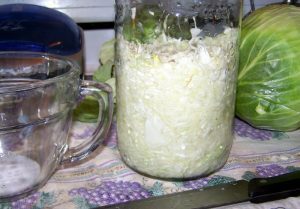 There should be enough brine from the salted cabbage to cover – if not, mix 1 ½ Tablespoons of salt in hot water, allow to cool, and top the jars with the additional brine. The cabbage has to be below the level of the brine. 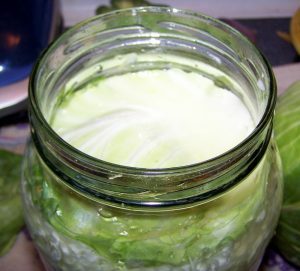 Another recipe I saw for this recommended cutting a cabbage leaf to size, and using it as a topper, to keep the cabbage shreds underneath – or just use a smaller jar filled with weights to keep the cabbage submerged. Cover the tops of the jars with cheesecloth held on with a rubber band, and let sit and ferment in a sheltered cupboard for 3-6 weeks, removing the scum which forms every day or so. When it's ready, either refrigerate it and eat fresh, or empty the sauerkraut into a big pan and bring to a gentle simmer – not a boil. Pack it into clean hot canning jars, leaving about half an inch of head-space, seal and process in boiling water; 15 minutes for pint jars, 20 for quarts. We have finally finished off the sauerkraut that I did last summer – so time to pickle again!